August 25, 2014 marked the culmination of 10 months of Wagner Roofing working closely with the parish of Holy Redeemer Catholic Church in Kensington MD to replace their steeple. The original 1962 steeple collapsed and fell onto the church roof from the 70’ high bell tower during the devastating derecho storm of June 29, 2012. Wagner worked with the Church’s insurer to establish an upgraded replacement scope of work. Wagner hired a structural engineer to perform a complete existing condition survey of the bell tower and develop schematic and construction drawings for the project. Copper Craft of Grapevine TX was enlisted as the steeple manufacturer that designed and fabricated the new spire and cross. A local steel erector was subcontracted to install new support steel and set the 34’ main spire and 8’ cross atop the existing bell tower. Wagner will complete installation of a copper standing seam roof tying the steeple into the bell tower roof prior to dismantling the scaffolding and returning the site back to the church to enjoy for years to come. Two years after a famously violent storm ripped the steeple off a Maryland church, that church is complete. After Mass Monday morning on the first day of school at Holy Redeemer Catholic Church in Kensington, 430 students were taken outside for a unique honor. 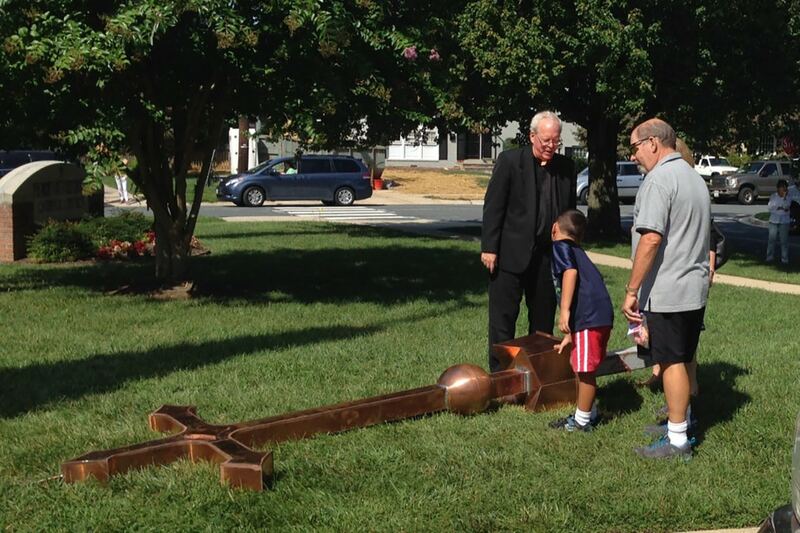 They got to touch the 34-foot cross replacing the steeple toppled by the high winds during the June 2012 derecho. Placing the new steeple above the 90-foot restored bell tower was a slow, precise process. The cross was lifted into place late Monday afternoon with a crane, and a construction crew is making sure it is installed to withstand the test of time and weather.